Today's economy is especially hard on small businesses. How does your small business keep revenue coming in when your customers are spending less? How do you attract new customers in a cost efficient manner? How do you protect your businesses' valuable information assets without making a huge technology investment? These are some of the more important questions small business owners face today. 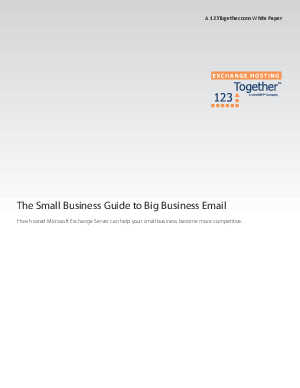 The good news is there's a simple answer to these questions - an answer that tens of thousands of small businesses have already discovered to help them address these concerns and become more competitive: Hosted Microsoft Exchange Server. This white paper will tell you how, for less than the cost of a client dinner, your business can start using a fully managed hosted version of Microsoft Exchange Server, and make quite a positive impact on your small business's ability to compete in today's uncertain economy.